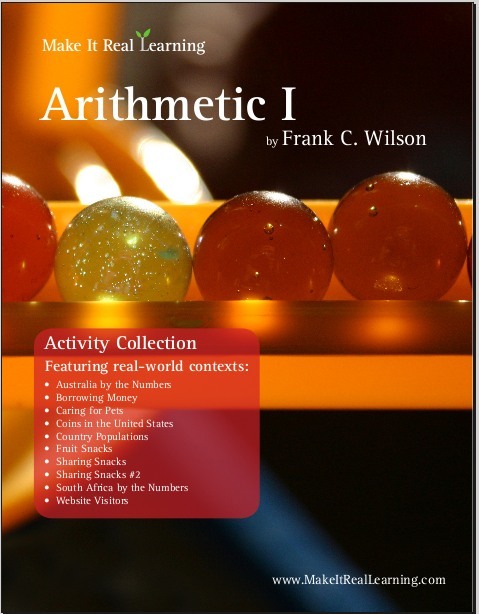 The Make It Real Learning Arithmetic I workbook focuses on real-world situations that may be effectively analyzed using arithmetic concepts such as addition, subtraction, estimation, division, bar graphs, and place value with large numbers. This book suits best grades 3-6. From figuring out how to determine the difference between the populations of two countries to analyzing the number of visitors to a website, learners get to use basic math skills in meaningful ways. Each activity integrates real world information, companies, and issues (e.g. Webkinz, Australia, South Africa, sharing snacks, borrowing money), not just "realistic" data.